Flowers are certainly a big part of Valentine’s Day, as gifting your gal with a gorgeous arrangement is sure to gain you some extra brownie points. However, poking fun at the holiday can also be fun. 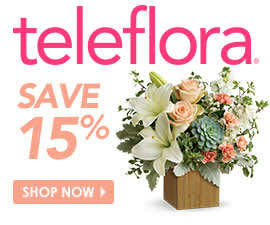 Case in point was a recent “Teleflora commercial which aired on Jimmy Kimmel Live,” and featured the famous Guillermo. During the ad, viewers watch as Guillermo, Kimmel’s parking lot attendant-turned-sidekick, confesses his love to his girlfriend – a tiny Chihuahua named Pepe​ – and offers her the Heartstring Bouquet by Teleflora, which she claims she loves. During the exchange, there is a knock at the door and a man enters holding yet another Valentine’s bouquet for Pepe. When Guillermo asks who could be behind the gift, a male Chihuahua named Paco enters and confesses his love for Pepe​, too. In true dramatic fashion, Guillermo demands Pepe select one of them to love, fans are then asked to tune in next year to see who Pepe picks. To ensure you’re the only guy in your girlfriend’s life this February 14, have the Heartstring Bouquet by Teleflora delivered to her home or office. She not only gets to stare at the gorgeous blooms, but receives a second gift of a a heart pendant with a 1-carat Swarovski Elements crystal on necklace around the vase.